Another of those odd moments last night, I was unable to sleep, something prompted by a recent conversation. Not entirely sure why it should keep me awake as it was about Jane Eyre, how having finally read the book after seeing so many adaptations I still had the same problem; Rochester’s betrayal of Jane and Jane’s subsequent forgiveness of Rochester. Why? It was always the least satisfactory part, a moment where my commitment to the story would falter. I understood that she loved him but, again, why? Only by the narrowest of margins is he prevented from being the cause of her ruin. And I suppose I had a light bulb moment, though when I write it down I feel silly because it seems obvious; she forgives him because that’s what love is. Something I vaguely remember being taught as a child, but long since forgotten. 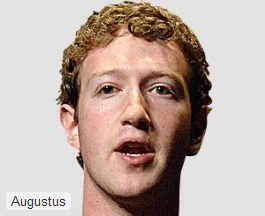 From Augustus, first emperor of Rome, to Zuckerberg, first emperor of the social network. 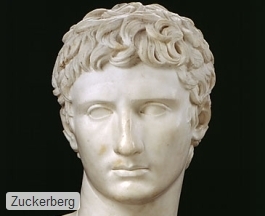 Is it coincidence that Mark Zuckerberg skipped studying for “Art in the time of Augustus” in order to build Facebook? Yes, of course it is, and a Google search reveals that Kari O’Brien (to name one) has already noticed the similarity in an earlier version of her blog, goddammit! The Alternative Vote tombola (AVt) is a refinement of the Alternative Vote (AV) voting system proposed in a referendum for later this year. It too is a form of preferential voting where voters mark the candidates in order of preference; the first choice is marked “1”, the second choice “2” and so on. Each candidate is allocated a colour. For every 1st preference vote a candidate is given ten tokens of their allocated colour, every 2nd preference vote receives eight tokens, 3rd preference receives six - all other preferences are assigned one token each. When every vote has been counted, the accumulated tokens of each candidate are placed in a large tombola and a winner is chosen by a local celebrity. Hence the alternative view that when evaluating a voting system, understanding how to vote is meaningless without an understanding of how your vote is counted. 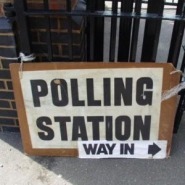 The Alternative Vote (AV), it is often argued, is a voting system that provides more data on the preferences of the voter as it requires the available candidates to be ranked in order of choice. However, though there is certainly more noise, I’m not convinced this equates to more information. For example, I have four candidates, A, B, C and D. I like candidate A and I loathe candidate D; how should I vote? Bearing in mind that the form of AV proposed for the UK doesn’t require a full list of preferences, the answer (it would appear) is ABC… or ACB. It’s the “or” that interests me. Since there is no ‘equal ranking’ – I can’t rank B and C as joint second – I am forced to make an arbitrary choice solely for the purpose of voting against D; most likely it will be a donkey vote. If candidate C fails to obtain a majority in the first round and candidate A is eliminated through having the fewest number of votes, my randomly chosen 2nd preference is now counted for those who remain. Whilst I achieve my aim of voting against D, is democracy best served if candidate C, with the most (1st choice) votes, loses out to candidate B through having an inferior position in the alphabet? Further, it may seem counter-intuitive but a vote of ABC doesn’t necessarily mean a preference of A over B, and B over C; it might do, but the only inference we can make with certainty is that it is a vote against D. Somewhat perversely, in comparison to this “anyone but them” portrayal of AV, our current first-past-the-post (FPTP) voting system in lacking this ability could be seen as requiring the voter to concentrate on who they vote for, rather than who they vote against. FPTP at minimum requires a “least worst” decision from the voter whereas AV, in this example at least, abrogates the responsibility. I spend a lot of time deriding the viewing habits of the general public, which is a polite way of saying a lot of my friends have poor taste. Television, I used to think, is an excellent guide to the decline of civilisation, but I consoled myself with the thought that no matter how bad it got we would never sink as low as our American cousins. Blind Date, which ran for an astonishing 18 years, disabused me of that notion; who commits the greater crime - the country that creates an appalling television format or the country that copies it? You buried my son under a knicker factory. Supporting the ‘right to strike’ - as I do - is an empty gesture if qualified with complaints about the timing; a strike has little point unless it inconveniences people. That’s not to say I’ve turned to the dark side, merely that the recent (and inaccurate) report suggesting ASLEF were considering action on the day of the royal wedding, seems designed to play on people’s prejudice, to encourage a negative attitude as opposed to healthy discussion. Like most, I can get irritated when personally affected, but it’s a reminder that if I fail to consider a judgement on the cause of the dispute I have no right to judge the effect. And now for something completely diff… more or less the same. The difference between an e-book and a real book: £3.04. 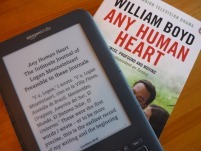 Having recently watched the brilliant Any Human Heart I thought I’d buy the book; I considered the e-book but settled on the ‘real’ thing after discovering the electronic version was over 75% more expensive. I’m familiar with this kind of occasional discrepancy when it comes to music, but the music industry has at least matured to the point that when I download an album it’s free of DRM and in a format I can play using any brand of player. 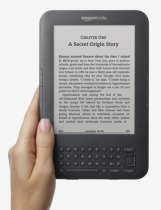 If I buy an e-book for my Kindle I am effectively bound to Amazon hardware. Yes, there are applications for reading your purchases on various LCD devices, but these aren’t suitable for extended reading; unless you’re OK with multiple breaks to recharge the battery and the (debatable) increased risk of eyestrain. Ironically though, it’s the increased eyestrain that may make me choose an e-book over the physical form next time around; on opening the book I find I have to hold it at arm’s length. It’s either that or ‘upgrade’ my glasses. I have finished my first e-book on the Kindle, Jane Eyre; which may account for my more than usual downbeat mood for the time of year. As a device it’s great, it's still on its first battery charge and has plenty of charge left. I can’t imagine reading at that length on an LCD display, says the software developer who spends eight hours of every day slumped in front of two 19” LCD monitors. It’s as easy as reading from a book and in some ways better. The iPad, often touted as competition, is I’m sure as good a general content consumer as you can get, but if you’re looking for a device for the specific purpose of reading (for long periods of time) an e-book reader, the cost of which has been driven down because of the iPad, is the way to go. On the hardware side I have only a couple of gripes. It has to be small but does the keypad have to be that difficult? Also, the Next Page/Previous page buttons situated on both the left and right sides of the Kindle are too low down; slightly heavier than I imagined, I tend to hold the Kindle further up the side – thus the buttons are partially obscured by my hand. These are small complaints; the keypad is rubbish but seldom used (for example a one-off set up for the Wi-Fi connection - there's a 3G version for an extra £40 - and registering the Kindle to my Amazon account) and the Next Page/Previous page criticism may just be an example of my general awkwardness. The keypad has a purpose; there’s an experimental web-browser for example, useful functions such as search/annotate and not least the ability to search/purchase/download new e-books. But unless you want to risk dashing your new hardware against the wall in frustration I’d stay well clear, though it’s solidly enough built that it would probably survive the impact. Leaving aside the contentious issue of DRM and the various publishing formats (Amazon use their own proprietary format), you can connect the Kindle using the USB lead provided and download a huge range of free e-books from sites such as Project Gutenberg. However, it’s the ability to purchase/download e-books, including a good range of those free e-books, from within the Amazon ecosystem where the Kindle scores. Use the built in keypad or use your computer, find the e-book on the Amazon website, click Purchase and… that’s it. There’s no download/synchronise option, it just happens; that’s a great user experience. Today is the day after tomorrow and all is well; well I know what I mean. We’re back at work and there’s no tidal wave, no earthquakes (not in this part of the UK anyway) and no... time to stop worrying about those events we can’t control. Whether it’s recession, bird flu or Manchester United winning the premiership; there’s little we can do, so it’s a good idea to think of those areas where we can make a difference. As to the rest we give our best, because whilst effort expended on lost causes may not be the smartest thing, it’s the human thing. And I’m happy with that. 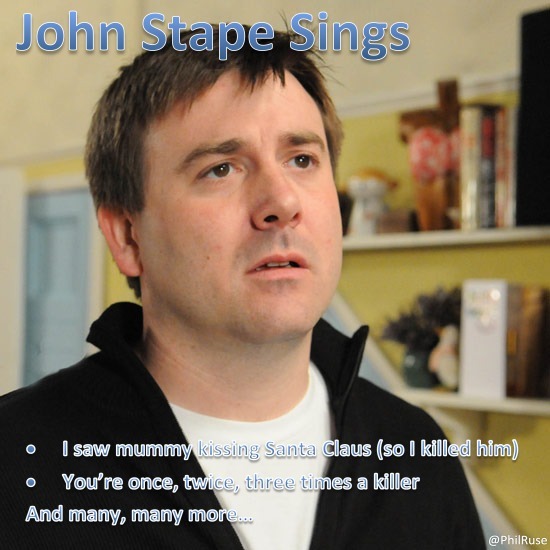 That was the worst Christmas ever. My Mum followed up her Christmas day stay in hospital with another surprise visit, preceded by bleeding out in the hour leading up to New Year’s Day. If they time her eye operation right she could have a Christmas/New Year/Easter day triple - there should be a prize. Mrs R is still below par, there’s a mountain of washing waiting for me in the kitchen, another of ironing in the spare room and work starts on Tuesday, for which the outlook is uncertain. On the plus side there’s a new coffee shop in town and they do a lovely chocolate muffin.